My daughter loves the Care Bears and when I asked her what she wanted to be for Halloween she said Cheer Bear. So I found a Cheer Bear costume and thought ‘OK, easy enough’. Then she started telling me mommy I really still wanna ride on an airplane. When can I go on an airplane? I have family all over and well, the truth is I cant afford it, but she doesn’t understand this. Then it hit me. Care Bears live in the clouds in Care-A-Lot. They also have a cloud plane. 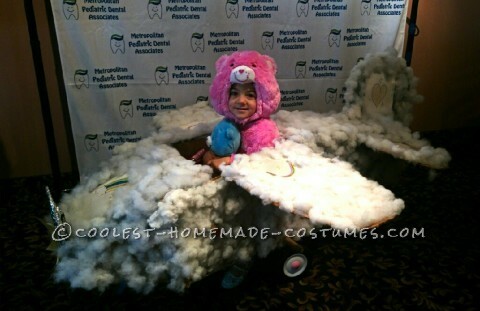 I knew then I had to make her a cloud plane to go with her Cheer Bear costume. I actually made a smaller trial version of the plane at first that she wore, but then I said to myself ‘I want her to be able to actually ride this plane’. So I took cardboard boxes and cut and shaped them. I used duct-tape to tape them together. I used fiberfill and a hot glue gun to make it look like clouds on the plane. We made rainbows and hearts. Then my husband and I put her tricycle underneath it so that she could actually ride it. Her reaction was priceless when she cried with joy and said mommy you made my wish come true, now I have my own plane! She was treated as if she was a celebrity when she went trick or treating. People stopped and stared. People asked to get pictures with her as well as kids asking if they could ride in it. I heard several times how people had never seen anything like that before and that it was the best costume they had seen. That alone made me feel like I accomplished a lot. She was telling everyone how she was Cheer Bear because she wanted to make people happy. Let me tell you, everyone had a smile on their face. The best feeling in the world is when I can make my daughter happy and I know that I did that.